The first basalar muscle (b1) is one of 17 small muscles in flies that control changes in wing stroke kinematics during steering maneuvers. The b1 is unique, however, in that it fires a single phase-locked spike during each wingbeat cycle. The phase-locked firing of the b1’s motor neuron (mnb1) is thought to result from wingbeat-synchronous mechanosensory input, such as that originating from the campaniform sensilla at the base of the halteres. Halteres are sophisticated equilibrium organs of flies that function to detect angular rotations of the body during flight. We have developed a new preparation to determine whether the campaniform sensilla at the base of the halteres are responsible for the phasic activity of b1. Using intracellular recording and mechanical stimulation, we have found one identified haltere campaniform field (dF2) that provides strong synaptic input to the mnb1. This haltere to mnb1 connection consists of a fast and a slow component. The fast component is monosynaptic, mediated by an electrical synapse, and thus can follow haltere stimulation at high frequencies. The slow component is possibly polysynaptic, mediated by a chemical synapse, and fatigues at high stimulus frequencies. Thus, the fast monosynaptic electrical pathway between haltere afferents and mnb1 may be responsible in part for the phase-locked firing of b1 during flight. Sensory motor reflexes are conspicuous features of circuits that maintain the proper orientation of the body during postural stasis and locomotion. For example, in the vestibulo-ocular reflex of vertebrates, information encoding involuntary head movements is used to stabilize the visual field on the retina (Carpenter, 1988). An analogous reflex is found among dipterous insects in which the direction and magnitude of body rotations are encoded and used to make corrective wing and head movements during flight (Faust, 1952;Sandeman, 1980; Hengstenberg, 1991). However, unlike vertebrates that possess a vestibular system for detecting head movements, the fly detects changes in body motion with specialized sensory organs called halteres. Halteres are barbell-shaped appendages of the third thoracic segment that are derived through evolution from the hind wings. During flight, these structures oscillate in antiphase to the wing and, hence, their massive end knob is subjected to a variety of forces. In turn, these forces are encoded into spike trains by specialized cuticular strain detectors, campaniform sensilla, that are arranged in five distinct fields at the base of the haltere (Fraenkel and Pringle, 1938; Pringle, 1948). Although the haltere is subjected to inertial and gravitational forces, the sensory cells appear most sensitive to Coriolis forces acting on the end-knob during angular rotation of the body (Nalbach, 1993, 1994). The compensatory reactions elicited by the halteres include head movements and changes in the wingstroke kinematics (Hengstenberg et al., 1986; Hengstenberg, 1988). The control of the wingstroke resides with a set of 17 small steering muscles that are typically active only during steering maneuvers (Dickinson and Tu, 1996). A notable exception to this rule is the first basalar muscle (b1), which fires a single action potential at a precise phase during each wingbeat. During visually induced steering reactions, the firing phase of the b1 may shift 1–2 msec within the wingstroke (Heide, 1983;Egelhaaf, 1989; Heide and Götz, 1996; Tu and Dickinson, 1996). These temporal changes, although small, can affect the biomechanical properties of b1 (Tu and Dickinson, 1994) and result in an increased stroke amplitude and adduction of the wing during the downstroke (Tu and Dickinson, 1996). Although the kinematic consequences of phase shifts in b1 now seem clear, the neural mechanisms underlying them are not. Wingbeat-synchronous mechanosensory afferents on the wing and haltere are thought to provide the feedback for the phase tuning of the b1 motor neuron (mnb1) (Heide, 1983; Miyan and Ewing, 1984). 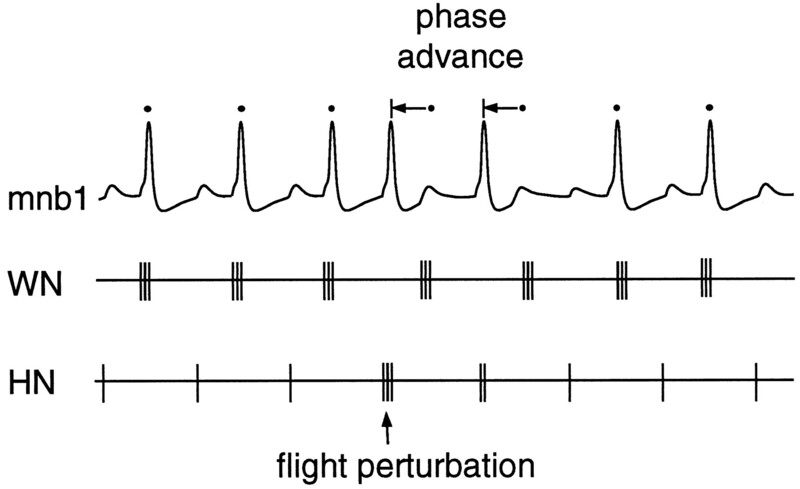 Haltere afferents are known to terminate in the mesothoracic neuropil, where flight motor neurons reside (Chan and Dickinson, 1996) and input from a single haltere is sufficient to provide some phase tuning of both the ipsilateral and contralateral mnb1s during flight (Heide, 1983). Taken together, these physiological and anatomical data suggest that haltere afferents may provide strong synaptic drive to mnb1. There has been, however, no direct demonstration of this sensory motor pathway. In this paper, we will present evidence that the reflex between the haltere afferents and mnb1 is monosynaptic, that it consists of both electrical and chemical synapses, and that the electrical component appears to be formed by afferents from a single haltere field. Preparation. We used 1- to 3-d-old adultCalliphora vicina obtained from a culture maintained in our laboratory. After anesthetizing the flies by cooling them at −10°C for 4 min, we removed all their legs at the trochanter-coxal joint and waxed the ventral side of the thorax to a 2 mm diameter brass rod. To remove the notum, an incision was made in the cuticle just above the anterior insertion of the dorsal longitudinal muscles (DLMs). Using this as the starting point, we cut around the dorsal surface of the thorax, detaching it from the pleuron. Next, we cut the DLMs at their anterior insertion and the gut at the neck joint. The dorsal cuticle was pulled away taking the pro- and mesothoracic dorsal ventral muscles (DVMs) along with it. With most of the power muscles gone, the thoracic ganglion was clearly visible, along with the haltere and wing nerves. A superficial incision was made in the ganglionic sheath by slipping a 30 gauge syringe needle just underneath its surface. By grabbing the cut ends, the sheath was peeled off the ganglion. Finally, we removed the pleurosternal muscles to reduce movements and thus improve the stability of the recordings. Recordings. Figure 1Ashows a diagram of the recording configuration. All physiological recordings were made at room temperature (19–23°C). Intracellular recordings were made with sharp electrodes filled with 3 m K-acetate plus 0.1 m KCl (resistances 40–60 MΩ). Intracellular signals were recorded using an Axoclamp 2A intracellular amplifier (Axon Instruments, Foster City, CA) and filtered at 10 kHz. Extracellular signals from suction electrodes on the b1 nerve and the haltere nerve were amplified with an A-M systems 1800 extracellular amplifier with bandpass filters set at 0.3 and 5 kHz. All signals were digitized using a Vetter 3000A PCM and stored on videotape for later analysis. We used Axotape software (Axon Instruments) for off-line inspection and analysis of the data. A, Experimental configuration for intracellular recording of mnb1. The preparation was perfused to allow constant exchange of solution. 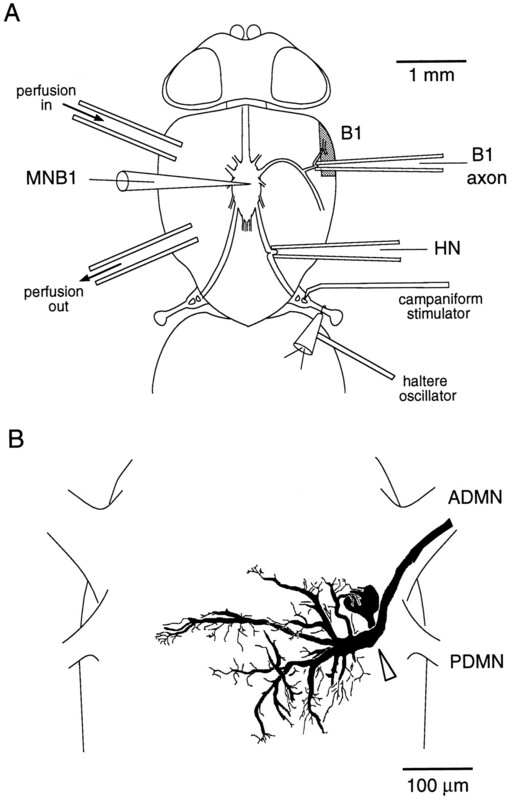 Suction electrodes were placed on the b1 nerve to record the activity of the mnb1 axon, and on the haltere nerve (HN) to record the response of haltere afferents.B, Diagram of Calliphora thoracic ganglion showing location of the mnb1. The arrowhead marks the putative recording site on the dendrite. The morphology of mnb1 is based on DAB-reacted biotinylated dextran back-fills of the b1 nerve and intracellular injections of neurobiotin. The identity of mnb1 in intracellular recordings was verified physiologically as explained in Materials and Methods. ADMN, Anterior dorsal mesothoracic nerve; PDMN, posterior dorsal mesothoracic nerve. Identification of the b1 motor neuron. The mnb1 was located by landmarks and occasionally by visual identification of its primary dendrite. The resting potential of mnb1 ranged from −50 to −60 mV. In preliminary experiments, we verified the cell’s identity by iontophoresis of either Lucifer yellow or neurobiotin at the end of an intracellular recording. These fills were then compared with preparations in which the motor neuron had been back-filled from the muscle with biotinylated dextrans and subsequently visualized using diaminobenzidine (DAB) (for protocol, see Chan and Dickinson, 1996). A camera lucida drawing of a back-filled preparation of mnb1 is shown in Figure 1B. However, anatomical verifications of mnb1 recordings were somewhat problematic because of the virtually identical central morphology of mnb1 and mnb2, the motor neuron supplying the second basalar muscle (Fayyazuddin et al., 1993). In cases in which the tracer did not fill the motor neuron axon past the point where it branches from the anterior dorsal mesothoracic nerve (ADMN), it was difficult to distinguish between intracellular fills of mnb1 and mnb2. For these reasons, and to allow the use of lower resistance electrodes, we developed a more rigorous criterion for identifying mnb1. In all experiments from which data are presented, we were able to verify intracellular penetrations of mnb1 by recording extracellular spikes from its axon using a suction electrode placed on the b1 nerve, a small branch of the ADMN that supplies b1 (Heide, 1983). The b1 nerve contains only the large axon of mnb1 (∼25 μm diameter) (Heide, 1983), a tiny axon from a ventral unpaired median cell supplying the b1 muscle (King and Tanouye, 1983; Tu and Dickinson, 1994), and a few small afferent fibers from sensilla on the side of the thorax (∼3 μm diameter) (Heide, 1983). The spikes in the mnb1 axon could be easily distinguished from those of other cells in the b1 nerve because of their large size and their one-for-one relationship with contractions in the b1 muscle. 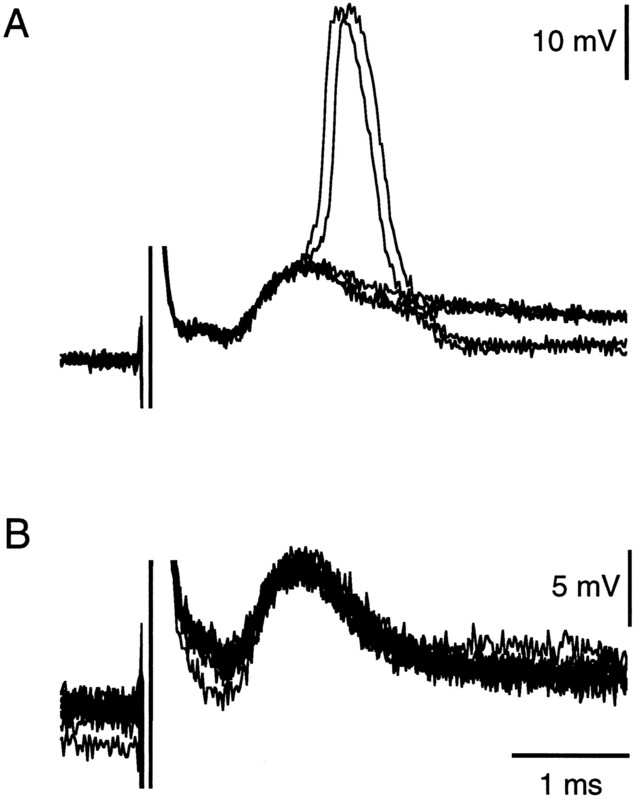 After intracellular penetration, the identity of mnb1 was established by injecting current to elicit spikes and verifying that extracellularly recorded spikes in the b1 nerve followed the intracellularly recorded spikes with a short latency (<1 msec) and in a one-for-one manner. Bath perfusion. We used a modification of the perfusion method of Hengstenberg (1982) to exchange solutions bathing the thoracic ganglion. Influx was gravity driven through a blunt 30 gauge needle placed just anterior to the right wing nerve. The efflux from the preparation flowed out through a beveled needle placed posterior to the left wing nerve. A peristaltic pump (Cole-Parmer) was used to move solution out of the bath. By this method, solutions could be exchanged within 60 sec with minimal movement in the level of the bath solution. The solutions used in the various experiments are given in Table1. Many of the experiments required changing the ionic milieu within the ganglion. To do this, we first had to develop a desheathed preparation (Treherne and Maddrell, 1967). In preliminary experiments, we tested the effectiveness of mechanical desheathing on ion exchange. With the ganglionic sheath intact, electrical stimulation of the haltere nerve elicited spikes in mnb1, but raising divalent concentration had no effect on spike threshold. In desheathed preparations, however, the mnb1 spike typically failed within 60 sec after superfusion with high-divalents saline. When combined with constant bath flow, the mechanically desheathed preparations provided viable recordings for >2 hr. Stimulation of haltere afferents. We mechanically stimulated the campaniform afferents by oscillating the haltere up and down through a stroke angle of ∼50° within its normal beating plane. The haltere stalk was threaded through a loop of human hair or fine nylon suture (Ethicon 7–0) held in either a 30 gauge needle or a polyethylene cylinder. The needle was attached to a piezoelectric crystal and vibrated with a triangular waveform, which more closely approximates haltere kinematics during flight than does a sinusoid (Nalbach, 1993; Dickinson, unpublished observations). We monitored the population activity of the haltere afferents using a suction electrode on the haltere nerve. The typical wingbeat frequency (and thus the frequency of haltere oscillation) during flight inCalliphora is 150 Hz (Pringle, 1948; Nalbach, 1993). However, intracellular recordings were more stable, and better separation of haltere compound action potentials could be achieved at lower stimulus frequencies. For this reason, we rarely oscillated the haltere at frequencies >75 Hz. In some experiments, the haltere afferents were stimulated electrically through the suction electrode on the haltere nerve. We stimulated individual campaniform sensilla by placing a fine probe (0.25 mm tungsten rod etched to a narrow point) on the surface of the appropriate sensory field. The stimulus probe was mounted on a piezoelectric crystal and was driven with a short trapezoid pulse. We assumed that we were stimulating a single sensillum if the extracellularly recorded spike from the haltere nerve responded with a fixed delay in an all or none manner to low-amplitude stimulation that was near the response threshold. In some experiments, we ablated identified haltere fields. In the cases in which dF2 was ablated, we first recorded from mnb1 and characterized the haltere input. Next we pulled the electrode out of the ganglion and ablated dF2 by slitting the cuticle on one end of the field with a 30 gauge hypodermic needle and lifting away the sensory epithelium containing the campaniform sensilla. We then reimpaled mnb1 and recorded its response to oscillation of the haltere. In experiments in which all fields except dF2 were ablated, we performed the ablations before making any recordings. Individual fields are named according to the nomenclature of Gnatzy et al. (1987). Figure 2 shows recordings from mnb1 and the haltere nerve during oscillation of the haltere with a 75 Hz triangle waveform. 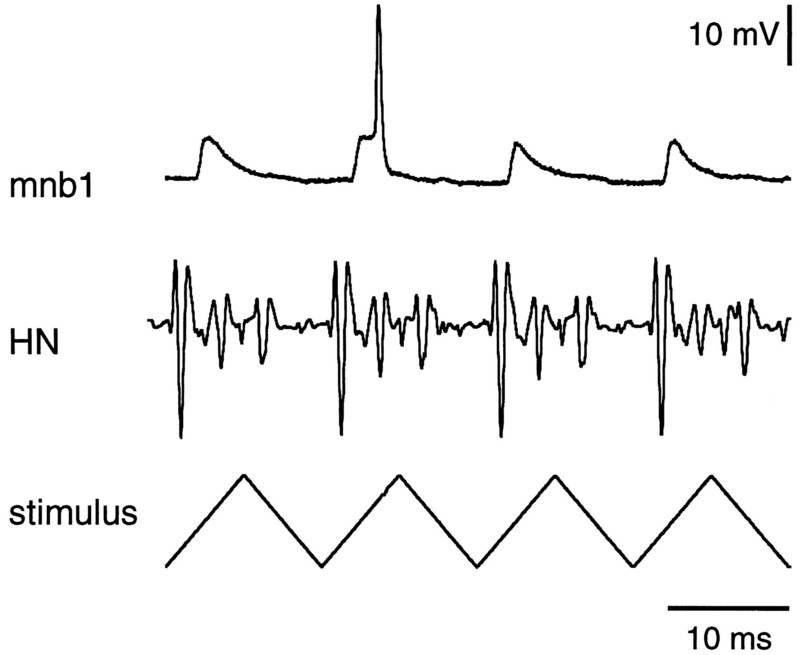 Mechanical oscillation elicited a regular pattern of compound action potentials in the haltere nerve that were tightly phase-locked within the stimulus cycle. In addition, each cycle of haltere oscillation produced a single phase-locked EPSP in mnb1. These EPSPs were typically 5 mV in amplitude and showed little variation in size from cycle to cycle even at higher stimulus frequencies. Both the size of the EPSP and the activity pattern in the haltere nerve were sensitive to the precise alignment of the plane in which the haltere was oscillated, indicating that the campaniform sensilla were quite sensitive to the direction of cuticular strain. We chose an oscillation plane that resulted in the largest membrane response in mnb1. In most experiments, this plane was oriented at about 30° with respect to the longitudinal body axis, approximately equivalent to the normal beating plane during flight (Nalbach, 1993). Response of mnb1 to mechanical oscillation of the haltere. Bottom trace shows the voltage used to drive the piezoelectric crystal attached to the haltere stalk. The middle trace shows phase-locked compound action potentials in the haltere nerve in response to haltere oscillation. The top trace is an intracellular recording from mnb1. Oscillation of the haltere produces a single subthreshold compound EPSP in every stimulus cycle. Occasionally, the EPSP crosses threshold and the mnb1 fires an action potential. In preliminary experiments, stimulation of small sets of campaniform sensilla in various haltere sensory fields indicated that only cells located in dF2 gave input to mnb1. Stimulation of single campaniform sensilla in dF2 resulted in unitary EPSPs in mnb1 (Fig.3A). Because these EPSPs were typically <500 μV, we averaged responses to better separate them from background noise. These EPSPs followed the extracellularly recorded presynaptic action potentials in the haltere nerve with a mean latency of 740 ± 50 μsec (mean ± SD, n = 6). Mapping of haltere fields onto mnb1. A, Stimulation of single campaniform sensilla in dF2 produces a unitary EPSP in mnb1. The bottom trace shows a single extracellularly recorded action potential in the haltere nerve that is followed by a small EPSP in mnb1 (top trace). This figure is an average of 13 sweeps. B, Ablation of dF2 eliminates haltere-synchronous EPSPs in mnb1. 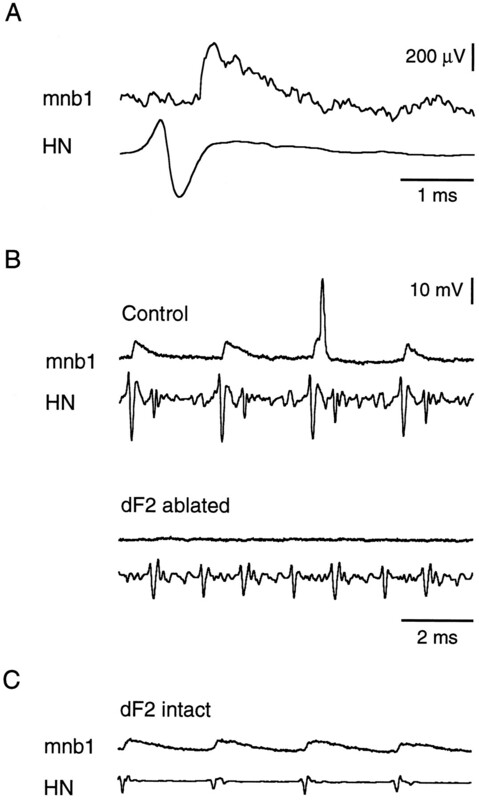 The top pair of traces are controls that were recorded before ablation of dF2 and show haltere-synchronous EPSPs in mnb1 and a full complement of compound action potentials in the haltere nerve. After ablation of dF2 (bottom pair of traces), mnb1 shows no haltere-synchronous activity. In addition, the ablation of dF2 changes the sizes of compound action potentials within the haltere nerve recording.C, In this experiment, all fields have been ablated except for dF2. The haltere nerve now contains only one major compound action potential that occurs just before each EPSP in mnb1. The time and voltage scales in C are the same as those inB. To further determine whether dF2 was solely responsible for all of the haltere input, we examined the effect of campaniform field ablation on the EPSPs in mnb1. In the first set of ablation experiments, we first recorded compound action potentials in the haltere nerve and the EPSPs in mnb1 evoked by 75 Hz mechanical oscillation of the haltere. We then withdrew the electrode from the cell and ablated dF2. After reimpaling mnb1, we examined the effect of the ablation on both the EPSP and the pattern of compound action potentials in the haltere nerve in response to mechanical stimulation. As shown in Figure 3B, ablation of dF2 completely eliminated the synaptic response in mnb1. In addition, the ablation resulted in attenuation of a single large compound action potential in the response of the haltere nerve. Because the orientation of the mechanical stimulus greatly influences the size of the EPSP, we oscillated the haltere in different beating planes, but in three of four cases, the EPSP was completely eliminated after dF2 ablation. The remnant of a small response in one experiment is difficult to interpret, because our ablation technique did not allow us to unambiguously determine whether we had eliminated all of the 108 sensilla in dF2 (Chan and Dickinson, 1996). However, as shown in Figure3C, the EPSPs in mnb1 persisted in experiments in which dF2 was left intact, but all of the other campaniform fields were ablated (n = 3). After ablation of four campaniform fields (dF1, dF3, vF1, and vF2), the EPSPs elicited in response to haltere oscillation are typically broader than those recorded in intact preparations. This is most likely attributable to a loss of synchrony of dF2 cells caused by the extensive mechanical damage of the haltere base during ablation. Taken together, the campaniform afferents in dF2 appear sufficient, and at least in large part necessary, to account for the EPSP in mnb1. Figure 4 shows the response of mnb1 to electrical stimulation of the haltere nerve. Electrical stimulation at 1 Hz produced a superthreshold EPSP followed by a smaller, slower depolarization. The latency of the fast component was 0.87 ± 0.09 msec (mean ± SD, n = 9), whereas the slow component peaked after 3.1 ± 0.7 msec (mean ± SD,n = 5). Because the peak in the slow event was sometimes hidden in the decay of the fast event, we could not measure its latency in all cases. The delay between haltere nerve stimulation and the mnb1 EPSP is comparable to the delay between the extracellularly recorded spike in the haltere nerve and the unitary EPSP in mnb1 in response to mechanical stimulation of a single campaniform in dF2. This suggests that the fast component consists, at least in part, of afferents within dF2. Frequency dependence of haltere-synchronous EPSPs in mnb1. Electrical stimulation of the haltere nerve produced a biphasic EPSP in mnb1 consisting of a fast superthreshold event followed by a smaller, slow event. Low-frequency stimulation at 1 Hz (shown in the left panel) produces no change in the EPSP from stimulus to stimulus. The middle panel shows the response of mnb1 to 10 Hz electrical stimulation of the haltere nerve, and the right panel shows the response to 100 Hz stimulation. After the first stimulus, the slow EPSP is still present during 10 Hz stimulation, whereas at 100 Hz it is greatly attenuated. All panels in this figure consist of five consecutive overlaid sweeps. Although the slow component was observed consistently during electrical stimulation, we were not able to distinguish it from the background during mechanical oscillation of the haltere. There are several possible explanations for this observation. A larger number of haltere axons appear to be activated by electrical stimulation than during mechanical oscillation of the haltere, as can be seen from the difference in the amplitude of the fast component of the EPSP in mnb1 under the two conditions (for example, compare Figs. 2 and 4). This attenuation with mechanical stimulation results in a less favorable signal-to-noise ratio for visualizing the slow component. Furthermore, electrical stimulation is likely to elicit a more synchronous firing of the haltere afferents than mechanical stimulation. The temporal spreading of the individual EPSPs responsible for the fast component might mask the onset of the smaller slow component when the haltere is stimulated mechanically. The latency between haltere nerve stimulation and the mnb1 EPSP consists of the synaptic delay plus the conduction delay within the haltere nerve. To gain a more accurate estimate of the synaptic delay, we measured the conduction velocity of the haltere afferents in one preparation. We placed two suction electrodes on the haltere nerve ∼650 μm from each other and measured the conduction delay between the two electrodes after stimulating the haltere mechanically. The conduction delay was typically 550 μsec, which yields a conduction velocity of between 1 and 1.2 m/sec−1 for the haltere afferents. Taking this conduction delay into account, the synaptic latency of the fast component reduces to at most 200 μsec, which is suggestive of a monosynaptic connection. Figure 4 shows the effect of electrical stimulation at different frequencies on the two components. Although stimulus frequency has little effect on the magnitude of the fast component, the slow component rapidly fatigues at stimulus frequencies >10 Hz (n = 6). Notice that even at 10 Hz, the amplitude of the second component drops significantly after the first stimulus in the train. This synaptic fatigue could result either from failures in the recruitment of the afferent fibers in response to the electrical stimulus or a decrease in synaptic efficacy within the sensory motor pathway. To test these alternatives, we increased the intensity of the electrical stimulus to values up to 10 times higher than that required to elicit a spike in mnb1. Even at these elevated stimulus levels, however, the slow component fatigued at high frequency. Furthermore, using low stimulus levels at which the number and strength of recruited afferents is insufficient to drive mnb1 past threshold, we can easily identify both the slow and fast components of the EPSP. Under these subthreshold conditions, the slow component of the EPSP still fatigues at high stimulus frequencies, whereas the fast component does not. If individual afferents are responsible for both of the components, then recruitment failure of sensory fibers cannot explain the fatigue of the slow response, because the fast response does not attenuate. On the other hand, if the two components are caused by separate populations of haltere afferents, it is unlikely that the failure probability of the two groups in response to electrical stimulation would differ so dramatically. In either case, therefore, we surmise that the decay of the slow component is most likely attributable to synaptic fatigue and not recruitment error. To further test for monosynapticity, we exchanged the normal bath solution with one containing an elevated concentration of divalent ions (see Table 1) to raise firing threshold. If an intervening spiking interneuron were present, it should fail at the elevated threshold (Berry and Pentreath, 1976), eliminating the EPSP in mnb1. However, as indicated in Figure 5, the results of these divalent exchange experiments are consistent with a monosynaptic pathway for the fast component. Although superfusion with high-divalent solution eliminated the spike in mnb1 (Fig. 5A), in all cases (n = 4) it failed to abolish the fast EPSP and did not cause an increase in synaptic latency, even when the haltere nerve was stimulated at 100 Hz (Fig. 5B). The spike failure served as a control that the high-divalent saline had access to the dorsal flight neuropil and that it did cause an elevation of membrane threshold. Replacing the high-divalent solution with normal saline restored the spikes in mnb1. Although we cannot unequivocally rule out the existence of a nonspiking interneuron, we believe that the divalent experiments, together with a measured latency of 200 μsec, argue strongly for a monosynaptic connection between the haltere afferents and mnb1. Effect of elevating threshold on the compound EPSP. A, Perfusion with saline containing three times the normal concentration of divalents. As the saline washes in, the spike in mnb1 completely disappears leaving just the EPSP. B, High-frequency stimulation (100 Hz) of the haltere nerve has no effect on the fast component of the EPSP (superposition of 10 consecutive stimulus cycles). It is unclear from these experiments whether the slow component is also monosynaptic. The amplitude of this component slowly decreased but never completely disappeared in high-divalent solution. Both the fatigue at high stimulus frequency and the relatively long latency would be consistent with a polysynaptic pathway, but we cannot rule out the possibility that the slow component represents a particularly labile monosynaptic input. The short synaptic latency of the rapid component suggested that it might represent an electrical synapse (Furshpan and Potter, 1959). In three experiments, we tested this hypothesis by replacing the normal saline with one containing no Ca2+ and an elevated concentration of Mg2+. As indicated in Figure 6, whereas the late component of the synapse was reversibly abolished in the presence of Ca2+-free saline, the early component was unaffected. The fact that the late component was affected by the superfusion serves as a control against the possibility that the Ca2+-free saline did not have access to the synaptic site. These results strongly suggest that the connection between haltere afferents and mnb1 consists of a mixture of electrical and chemical synapses. Effect of removing Ca2+ from the bath. In this experiment, the membrane response is entirely subthreshold, so no action potentials are masking the slow component. In the presence of Ca2+-free saline, the slow component completely disappears, whereas the fast component is unaffected. The slow component reappears when the Ca2+-free saline is replaced with normal saline. This study is part of an ongoing attempt to determine the circuitry that underlies the flight control behavior in the blowfly. We have chosen to focus on mnb1 because of its unique firing pattern during flight and its clear importance in the control of wingbeat kinematics (Tu and Dickinson, 1996). Using extracellular recordings,Mielke and Heide (1993) have reported that electrical stimulation of the haltere nerve leads to action potentials in the b1 muscle with a latency of 3–4 msec. We have now identified the cellular connections that are presumably responsible for this reflex. From intracellular recordings, we have found that mnb1 responds to haltere nerve stimulation with a compound EPSP that is composed of two parts. The results of divalent experiments rule out the presence of interposed spiking interneurons for the fast component of the EPSP. We therefore conclude that the fast haltere input to mnb1 is monosynaptic. This assertion is supported by the short, 200 μsec synaptic latency of the fast component. The short latency and lack of dependence on external Ca2+ suggest that the fast component represents a summation of electrical synapses between haltere afferents of dF2 and mnb1. In contrast, the slow component is Ca2+-dependent, as expected of a transmitter-mediated synapse. In addition, whereas the fast component of the haltere–mnb1 synapse can follow high stimulus frequencies without attenuation, the slow component shows fatigue at frequencies >10 Hz. Of the five haltere campaniform fields, we have shown that at least one, dF2, projects onto mnb1. Stimulation of single campaniform sensilla on dF2, but not on other campaniform fields, evoked short-latency EPSPs in mnb1. The importance of dF2 in this pathway is supported by a recent anatomical study (Chan and Dickinson, 1996) in which campaniform afferents and mnb1 were labeled with different fluorescent probes. A tuft of terminals from dF2 campaniform cells forms a calyx that wraps around the primary neurite of mnb1 near the point of origin of the axon. Furthermore, dye transfer experiments with neurobiotin, a tracer that crosses gap junctions, show coupling between dF2 afferents and mnb1 (A. Fayyazuddin and M. Dickinson, unpublished observations). The location of this putative contact is peculiar in that it would bypass the extensive dendritic arbor of mnb1. However, a synapse so near to the axon might serve to minimize the reflex time within the sensory motor circuit and is consistent with the physiology described in this paper. Previous anatomical studies in flies also support our findings. Hengstenberg et al. (1988) and Hausen et al. (1988) have shown that cobalt fills of haltere afferents spread to motor neurons, including mnb1. Cobalt coupling between neurons in the CNS of flies has been taken as evidence for the existence of gap junctions between the coupled cells (Strausfeld and Bassemir, 1983). Flies can make extremely fast maneuvers in response to the motion of visual targets during flight. For example, during mating chases, a male fly can visually track a female and make corrective course changes within 30 msec (Land and Collett, 1974; Wagner, 1986a,b,c). To make rapid maneuvers, the fly stabilizes the visual field on its retina by adjusting the position of its head and body (Hengstenberg, 1991). These course corrections must rely, in part, on rapid modulation of motor output via sensory reflexes that function within a single, 6–7 msec stroke cycle. The final target for these reflexes is the small population of steering muscles that insert directly onto the sclerites of the wing hinges and control the changes in stroke kinematics (Wisser and Nachtigall, 1984; Dickinson and Tu, 1996). The phase-locked firing of the steering muscles responsible for these maneuvers suggests that they are tuned by wingbeat-synchronous mechanosensory afferents (Heide, 1983). Of the steering muscles that have been recorded during flight, most become active only during turning maneuvers. The b1 muscle, however, is unique in that it fires a single action potential within a narrow phase band during nearly each wing stroke (Heide, 1983;Egelhaaf, 1989; Heide and Götz, 1996). Recently, Tu and Dickinson (1996) showed that the activation of this muscle inCalliphora is necessary to reconfigure the wing hinge and enable the wing to undergo a complete wing stroke. In addition to this tonic role, small changes in the phase of b1 activation can modify the trajectory of the downstroke on a cycle-by-cycle basis. In particular, advances in b1 phase result in an increased stroke amplitude and a strong adduction of the wing during the downstroke. These kinematic changes are probably used during turning because flies modulate the phase of b1 firing when presented with a visual optomotor stimulus (Heide, 1983; Egelhaaf, 1989; Heide and Götz, 1996; Tu and Dickinson, 1996). The constant phase-locked firing pattern of mnb1 requires continuous feedback from wingbeat synchronous afferents during flight (Heide, 1983). There are several potential sources of this sensory drive. In addition to the afferents in dF2 at the base of the haltere, mnb1 also receives phasic input from mechanoreceptors on the wing (Heide, 1983). The wing modalities potentially responsible for this include the pterale C wing hinge receptor (Miyan and Ewing, 1984), the large distal campaniform sensilla (Dickinson, 1990a,b), and the proximal campaniform fields (Cole and Palka, 1982; Gnatzy et al., 1987). The latter group, the proximal wing campaniforms, are the serial homologs of the sensory fields at the base of the haltere (Palka et al., 1979). Together with the dF2 campaniforms on the haltere, these wing modalities must tune mnb1 to fire at its characteristic phase within the wingbeat cycle. However, the feedback circuitry must account not only for the phase tuning of the mnb1 during straight flight but also for the changes in firing phase that occur during voluntary and corrective steering maneuvers. For the mnb1 phase to advance relative to the wing stroke, either the firing of the mechanosensory afferents themselves must advance or the response of mnb1 must change so that it fires with shorter latency at the arrival of the mechanosensory input. For example, during a steering maneuver, descending visual interneurons might alter the membrane properties of mnb1 so that it reaches threshold earlier in response to the wingbeat synchronous afferents. Although we cannot rule out such a mechanism, it seems more likely that the phase shifts in mnb1 are driven directly by changes in the firing of mechanosensory afferents. As indicated in this study, the spike latency between haltere afferents and mnb1 is <200 μsec, and neither changes in postsynaptic membrane properties nor presynaptic inhibition of the sensory terminals could make the motor neuron fire 1–2 msecearlier in response to activation of the haltere campaniforms. In addition, the putative synaptic site between the dF2 afferents and mnb1 is close to the origin of the motor axon, bypassing the putative dendritic portion of the neuron (Chan and Dickinson, 1996). A model that accounts for both the background phase tuning of mnb1 and the phase advances during turning maneuvers is shown in Figure7. The model is based on the assumption that wingbeat synchronous input from the wings and the halteres arrives at mnb1 at different times within each cycle. During straight flight, the afferents in dF2 are quiescent, and mnb1 is tuned by the mechanoreceptors on the wing. If the flight trajectory is perturbed, Coriolis forces acting on the haltere alter its beating plane thereby activating the sensilla in dF2. The resultant synaptic drive from dF2 brings mnb1 to threshold at an earlier point in the wingbeat cycle. The refractory properties of mnb1 would then inhibit it from firing in response to the subsequent wing input. When the flight path is stabilized and the Coriolis forces attenuate, the firing of mnb1 is once again set by the mechanoreceptors on the wing. Such a scheme would account for the advances in mnb1 phase during corrective reflexes, but not during voluntary or visually induced turning maneuvers. One potential means by which the fly could voluntarily activate the corrective reflex is through the haltere steering muscles, the serial homologs of the control muscles of the wings (Bonhag, 1949; Mickoleit, 1962). Recently, it has been shown that the activities in at least two of these haltere muscles are strongly affected by both visual flow and head movement (Prete and Dickinson, 1995). Thus, input from descending visual and mechanosensory interneurons might mimic the Coriolis forces that occur during corrective reflexes by activating muscles that directly alter the kinematics of haltere motion. This system would be analogous to the spindle organs of vertebrate skeletal muscles, in which the firing of gamma motor neurons can activate the Ia afferents and mimic the response to an externally imposed stretch (Jansen and Matthews, 1962). Hypothesis that might explain how convergent mechanosensory input determines the firing phase of mnb1 during flight. The drawings are a schematic representation of the hypothesis, not actual data or the result of computer simulations. Both wing and haltere afferents provide an excitatory synaptic drive to mnb1, but the input from the two modalities arrives at different times within the stroke cycle. During stable flight, the firing phase of mnb1 is determined by the strong input from the wing afferents. During flight perturbations, recruitment of dF2 campaniforms causes the haltere input to be transiently stronger, thereby advancing the phase of mnb1. As the perturbation is corrected, the phase of mnb1 firing is once again determined by wing input. HN, Haltere nerve; WN, wing nerve. The model outlined above is certainly not the only scheme that could account for the phase tuning of mnb1 during flight. Given the current data, however, we believe that this is the most parsimonious explanation that accounts for the observed behavior and physiology. Further, it should be possible to test the model by examining the interaction of convergent wing and haltere mechanoreceptors onto mnb1, and by determining the effect of haltere muscle activity on the firing of dF2 campaniform neurons. In any event, given the critical role of both the b1 muscle and the haltere afferents in flight behavior (Heide, 1983; Nalbach, 1994; Tu and Dickinson, 1996), the strong monosynaptic connection that we have characterized in this paper must represent an important pathway in the flight control system. This study was supported by National Institutes of Health Training Grant T32-GM-07839 to A.F., and by the David and Lucille Packard Fellowship for Science and Engineering and National Science Foundation Grant IBN-0208765 awarded to M.H.D. We thank Dr. Jonathan Art for use of the piezoelectric crystal used for mechanical stimulation in this study. Correspondence should be addressed to Michael Dickinson, Department of Integrative Biology, University of California, Berkeley, CA 94720. (1976) Criteria for distinguishing between monosynaptic and polysynaptic transmission. Brain Res 105:1–20. Bonhag PE (1949) The thoracic mechanism of the adult horsefly (Diptera: Tabanidae). Mem Cornell Univ Agric Exp Stat 285. (1988) Movements of the eyes. (Pion, London). (1996) Position-specific central projections of mechanosensory neurons on the haltere of the blow fly, Calliphora vicina . J Comp Neurol 369:405–418. (1982) The pattern of campaniform sensilla on the wing and haltere of Drosophila melanogaster and several of its homeotic mutants. J Embryol Exp Morphol 71:41–61. (1990a) Comparison of encoding properties of campaniform sensilla on the fly wing. J Exp Biol 151:245–261. (1990b) Linear and nonlinear encoding properties of an identified mechanoreceptor on the fly wing measured with mechanical noise stimuli. J Exp Biol 151:219–244. Dickinson MH, Tu MS (1996) The function of Dipteran flight muscle. Comp Biochem Physiol A, in press. (1989) Visual afferences to flight steering muscles controlling optomotor responses of the fly. J Comp Physiol A 165:719–730. (1952) Untersuchungen zum halterenproblem. Zool Jahrb Physiol 63:325–366. (1993) Comparative anatomy of the basalar motor system in the blowfly, Calliphora . Soc Neurosci Abstr 19:1600. (1938) Halteres of flies as gyroscopic organs of equilibrium. Nature 141:919–920. (1959) Transmission at the giant motor synapses of the crayfish. J Physiol (Lond) 145:289–325. (1987) Campaniform sensilla of Calliphora vicina (Insecta, Diptera). I. Topography. Zoomorphology 106:312–319. (1988) Flight control circuits in the nervous system of the fly: convergence of visual and mechanosensory pathways onto motoneurons of steering muscles. Sense organs between environment and behaviour (Elsner N, Barth FG, eds), p 130. Proceedings of the 16th Göttingen Neurobiology Conference. (Thieme, New York). (1983) Neural mechanisms of flight control in Diptera. Insect flight (Nachtigall W, ed), pp 35–52. (Fischer, Stuttgart). Heide G, Götz KG (1996) Optomotor control of course and altitude in Drosophila is achieved by at least three pairs of flight steering muscles. J Exp Biol, in press. (1982) A method of microperfusion with oxygenated saline as applied to an insect brain. J Neurosci Methods 6:169–171. (1988) Mechanosensory control of compensatory head roll during flight in the blowfly Calliphora erytherocephala Meig. J Comp Physiol A 163:151–165. (1991) Gaze control in the blowfly Calliphora : a multisensory, two-stage integration process. Semin Neurosci 3:19–29. (1986) Compensatory head roll in the blowfly Calliphora during flight. Proc R Soc Lond [Biol] 227:455–482. (1988) Cobalt pathways from haltere mechanoreceptors to inter- and motorneurons controlling head posture and flight steering in the blowfly Calliphora . Sense organs between environment and behaviour (Elsner N, Barth FG, eds), p 129. Proceedings of the 16th Göttingen Neurobiology Conference. (Thieme, New York). (1962) The central control of the dynamic response of muscle spindle receptors. J Physiol (Lond) 161:357–378. (1983) Anatomy of motor axons to direct flight muscles in Drosophila . J Exp Biol 105:231–239. (1974) Chasing behaviour of houseflies (Fannia cannicularis ). J Comp Physiol [A] 89:331–357. Mickoleit G (1962) Die thoraxmuskulatur von Tipula vernalis meigen. Ein beitrag zur vergleichenden anatomie des dipterenthorax. Zool Jahrb Anat Bd 80: 213–244. (1993) Effects of artificially generated haltere nerve afferences on the activation of the flight steering muscles in Calliphora . Gene-brain-behaviour. Proceedings of the 21st Göttingen Neurobiology Conference (Elsner N, Heisenberg M, eds), p 207. (Thieme, Stuttgart). Miyan JA, Ewing AW (1984) A wing synchronous receptor for the dipteran flight motor. J Insect Physiol 10: 567–574. (1993) The halteres of the blowfly Calliphora . I. Kinematics and dynamics. J Comp Physiol [A] 173:293–300. (1994) Extremely non-orthogonal axes in a sense organ for rotation: behavioural analysis of the dipteran haltere system. Neuroscience 61:149–163. (1979) Neural projection patterns from homeotic tissue of Drosophila studied in bithorax mutants and mosaics. Dev Biol 69:549–575. (1995) A visually-sensitive haltere control muscle of the blowfly, Calliphora . Soc Neurosci Abstr 21:1276. (1948) The gyroscopic mechanism of the halteres of Diptera. Philos Trans R Soc Lond [Biol] 233:347–384. (1980) Angular acceleration, compensatory head movements and the halteres of flies (Lucilia serricata ). J Comp Physiol [A] 136:361–367. (1983) Cobalt-coupled neurons of a giant fibre system of diptera. J Neurocytol 12:971–991. (1967) Axonal function and ionic regulation in the central nervous system of a phytophagous insect (Carausius morosus ). J Exp Biol 47:235–247. (1994) Modulation of negative work output from a steering muscle of the blowfly Calliphora vicina . J Exp Biol 192:207–224. (1996) The control of wing kinematics by two steering muscles of the blowfly, Calliphora vicina . J Comp Physiol [A] 178:813–830. (1986a) Flight performance and visual control of flight of the free-flying housefly (Musca domestica L.) I. Organization of the flight motor. Philos Trans R Soc Lond [Biol] 312:527–551. (1986b) Flight performance and visual control of flight of the free-flying housefly (Musca domestica L.) II. Pursuit of targets. Philos Trans R Soc Lond Biol 312:553–579. (1986c) Flight performance and visual control of flight of the free-flying housefly (Musca domestica L.). III. Interactions between angular movement induced by wide- and small field stimuli. Philos Trans R Soc Lond Biol 312:581–595. (1984) Functional-morphological investigation on the flight muscles and their insertion points in the blowfly Calliphora erytherocephala (Insecta, Diptera). Zoomorphology 104:188–195.